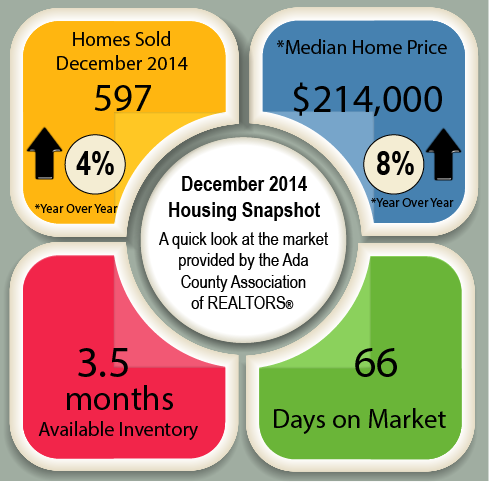 The Ada County Association of Realtors (ACAR) just released December 2014 sales numbers. I thought the graphic provided a nice snapshot. Click on the image below to link you to the full report. Below is a quick summary. December sales were up by 4% from December 2013, but when you look at total sales for all of 2014 compared to total sales in 2013, they went down 2.5%. December median home price was $214,000; up 8% from December 2013. The 2014 median home price was $210,000 which is 6% over 2013. The price categories in shortest supply are homes between $100,000 to $119,000 which has a 1.3 month supply and homes between $120,000 to $159,000 have a 1.8 month supply. In December, sales in the latter category were up 17% over November sales.